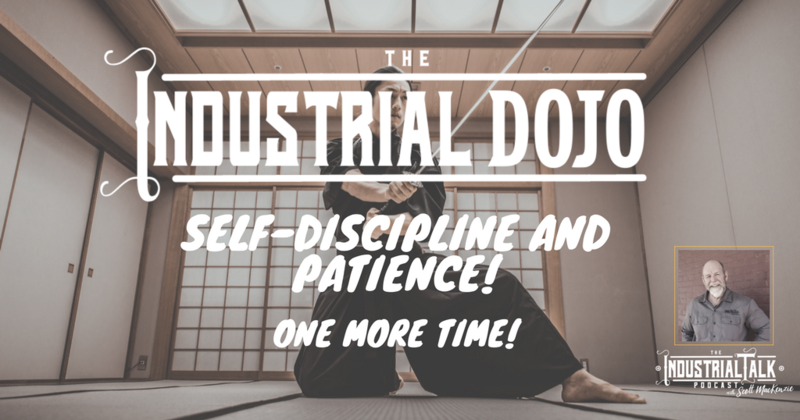 5-Minute Pep Talk on Self-Discipline and Patience! Think of that Premier Athlete that demonstrates incredible Mental Strength through pain, disappointment, setback and unimaginable challenges. Through it all, champions persevere. They continue to demonstrate incredible Self-Discipline and Patience and believe in that One More Time I will be victorious. As Industrial Leaders, Self-Discipline and Patience are the foundation of success. [00:00] You are listening to the industrial talk podcast network. [00:16] Alright. Thank you very much for joining the industrial talk podcast. This is the industrial Dojo. This is where we get you in shape. We talk about mental strength, clarity, good thinking, all that stuff. So then you could be a top notch professional in your craft. So Time's important. Let's get going. Let's make this happen. [00:40] Alright. Gradients as a commitment to you. I want to make sure that this was quick, direct, tactical, and hits the spot that you can be the best possible professional that you could possibly be a. If you want to know my background, I think it was in the first industrial Dojo, so if you miss that to know who I am. Well go listen to that one. That'd be great. So we've been going through a number of things on building an industrial leader and quite frankly it's been about a, that mental toughness that the ability to be able to persevere, right? Have that tenacious mindset. So let's review. We've got correct thinking. We're not letting the past dictate our future. We've got a positive outlook, you know, we like our people, we like where we're at, we're just positive because we want to hang out with positive people who are optimistic about the future, that is bright purpose, rock solid purpose, something that keeps you moving forward and if you get knocked down, you can get back up because that purpose is far greater than, than that scuffed knee, right? [01:44] Genuine interest in the well-being of people. You got to have that. If they're successful, you're successful, flip that pyramid upside down, be a servant and they will be successful. And, and that's the best thing that you can do. Resistance to criticism. Let's have that thick skin because if you're moving forward and if you're doing what you need to do to, uh, you know, help the company, help your family be a better person, all that good stuff. There's going to always be individuals that one won't hold you back. And then of course, confidence in your own ability. You're listening to the industrial tech podcasts. I guarantee you're, you're reading books. I know that you're out there looking for solutions, so be confident. Know that you're doing the right things, it's all good and if you make a mistake, so what? Because you got correct thinking. So it's all good. [02:37] So let's talk about self-discipline and patience, right? One of the things that, uh, and this is the, this is the talk for today, if you're looking at it on the video, it's right behind me. And so self-discipline and patients, I am fascinated. I am fascinated by the mental strength. And so what, what brought this to my attention is if you think about elite athletes, no matter what the sport is, if they're at the top of their game, something about their mental toughness. So I've been really getting into the AH, the hockey playoffs and I've highlighted the fact that they're tenacious, right? They never give up. This is the real deal. Right? And what fascinates me about it is, you know, they hurt, they play every other day, they get hit hard every other day they get knocked down, they get back up. And Man, I've never seen such mental toughness and I don't know the personal and I don't really care to write, but if you think about that premier athlete and what, what the Dojo is all about, we want to be able to push that envelope. [03:45] We want to be able to say, get back up, but we've got to have that self-discipline and we've got to continuously learn and we've got to constantly tell us one more time. And I challenge you. Say you have a bad day, right? So something didn't go right. Um, whatever the feedback might be, I just ask that you tell yourself one more time, think about that mental toughness. Be self-disciplined. Do it again, do it again, do it again, right? And get back up and dog gone it one more time. Be patient. If you're looking for the big win, it's going to disappoint you. But right now self-discipline, be patient. And tell yourself one more time. We're developing mental strength here. So once again, you've got confidence in your abilities, right? You're, you're learning, you're growing, you're always pushing the envelope. That's fantastic. You will have thick skin because you want to be something bigger, greater and, and so your resistance to criticism and you have genuine self interest in people, right? You got that rock solid purpose. You've got that positive outlook because you are a positive person hanging out with positive people who have a bright future and then of course always have that correct thinking. Thank you very much. I know that you are busy. That concludes this days. I guess pep-talk. Keep going. One more time. Do not. Do not quit. You think you're going to do that. I'm going to make sure that I call you out, so have a. have a great day. Be Safe as always, and I will talk to you tomorrow.